When your low back hurts it is always a good idea to use ice on it, even if your lower back pain is an acute aggravation of an old or chronic problem. The rule of thumb is that when there is inflammation ice is an appropriate treatment. 2. Use the correct size and style ice pack. Make sure the bag is large enough to cover the area of the low back or hip or neck that is bothering you. If you have only small bags you might need more than one to cover the area well. Flexible ice packs or gel packs that can be molded to the contour of the body make most sense. 3. Apply the ice quickly to the injured and painful area, the sooner the better. Applying intense cold is most effective in the immediate period after injury. As long as there is pain in the low back you can assume there is inflammation, and if there is inflammation applying an ice pack will be beneficial. 5. 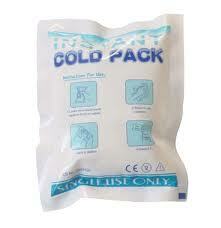 Do not put the cold pack in direct contact with bare skin. Ice applied directly to the bare skin can cause immediate damage to the skin, particularly if the skin is damp. Put something between you and the ice, like 1-2 layers of paper towels or a single layer of an old tee-shirt or handkerchief that will act like a very thin layer of insulation – but not too much!. Many layers or insulation or a thick bath towel will keep the cold from affecting the area, preventing any benefit of the ice pack. When you do it correctly, you should feel intense cold in the area within a few seconds after applying the ice pack; if it takes longer than that, remove some of the insulation. 6. Experts agree to use the ice pack no more than 20 minutes out of every hour, or at minimum, 20 minutes three times a day. Applying ice to an area for too long will not only damage the skin, but it will not have any greater benefit to you to reduce inflammation and pain. This is particularly true for people with chronic health problems like diabetes, rheumatoid arthritis or peripheral nerve damage. If your skin is so numb from the cold that you can’t feel your skin, you will not know if the skin is being damaged. a. Fill a paper cup all the way to the top with water and place in the freezer. b. Once frozen, to use, simply tear off some paper to expose the ice. c. Wrap paper towels around the cup to keep the fingers from getting cold. 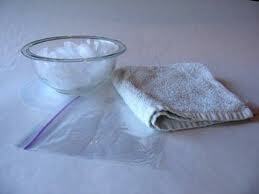 d. Place towels around the area you will apply this ice to catch the water as the ice melts on the skin. e. Massage the area you want to be iced by rubbing it with the exposed ice from the cup. Use a fairly deep and aggressive pressure to help move the inflammation fluid out of the area; do not apply so much force that pain is felt. f. Massage the area for 5-15 minutes. Be sure to let the area warm up and is no longer numb before using ice pack again. 8. Repeat applying a cold pack as often as desired. Apply ice as frequently as you wish, so long as you use a 40 minute break from the ice so the cold packs are not used constantly. It is generally good to reapply a cold pack to the low back if the area is warm to the touch and has full normal sensation before re-applying. 9. You can also use a bag of frozen peas or corn from your refrigerator if you have an emergency and do not have an ice pack ready. This frozen food bag can be refrozen and reused, but you probably will not want to eat it since some of the vegetables will eventually become thawed and refrozen a few times and this will likely spoil it over time.